August Overseas Filipino remittances slipped by 0.9% year-on-year with a total of $2.476 billion sent home in August. All major sources of remittances saw growth save for the Middle East which experienced an inexplicable 28.8% drop in flows. This brings the year-to-date haul to $19.056 billion, up 2.5% from the same period in 2017 as OFW remittances continue to be a stable source of FX to the Philippines. The contraction in annual terms shows that the seasonality in remittances continues to shift, mainly due to school year changes as well as to possible late payments to workers. 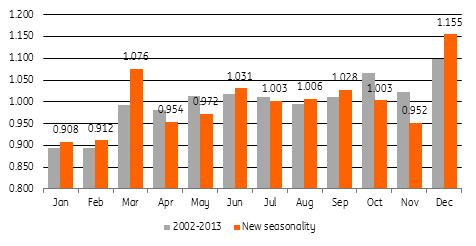 A structural shift occurred in 2014 to yield the new seasonality, with remittances apparently saved for the December holidays (more pronounced now) and in March. Nuances in exchange rates given the divergence in monetary policy may have also caused the discrepancy given yearly growth rates. Going forward, annual and year-to-date growth rates are still seen to average around 3%. Many sectors have lamented the fact that the trade deficit has zoomed past the traditional structural sources of FX, namely OF remittances and BPO call centre receipts. Given the robust growth in capital goods and raw materials imports, the trade deficit has ballooned to eclipse both remittances and BPO receipts, yielding current account deficits. However, once the investment cycle turns, we could expect remittances and BPO call centre receipts to chug along steadily while capital imports and raw materials peter out to once again yield current account surpluses after the Philippines has built up its infrastructure and productive capability.